Captain America might be subtitled The First Avenger, but he is, in fact, the last of the Marvel Comics superheroes to receive blockbuster movie treatment before he assembles alongside Hulk, Iron Man and Thor in next year’s superhero team mega blockbuster The Avengers (a teaser of which appears at the end of this film’s closing credits). Captain America is, in another sense, The First Avenger, because he’s Marvel’s first superhero, chronologically-speaking. Created by Joe Simon and Jack Kirby before Marvel existed, the star-spangled patriot made his comics debut in 1941 and became a popular propaganda icon until, with the waning interest in superheroes in the post-war period, he was retired in the 1950s. Left frozen in suspended animation, Cap was, with the resurgence of superheroes in the 1960s, thawed out to join The Avengers and he’s been popular ever since. 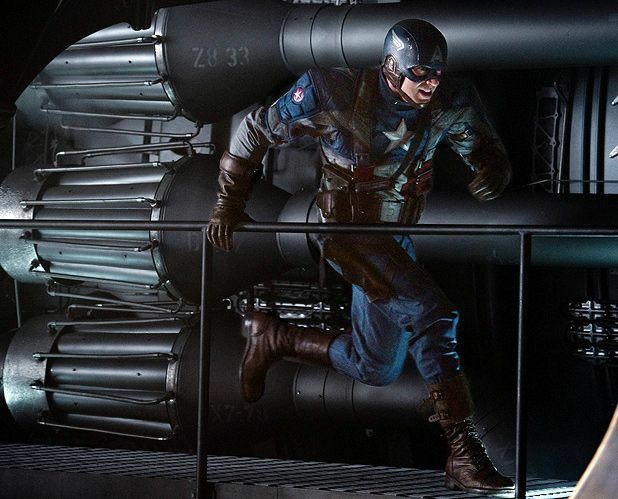 Focusing on Cap’s origin story, the film takes place almost entirely in the 1940s, although it’s book ended by his rediscovery in the present day. There’s novelty value in a superhero adventure being set in the past (it worked well for the sixties-set X-Men: First Class) and there’s more than one reference to an obvious influence: another forties pulp hero best know for his hat and whip. Like that adventurer, Cap (played by buffed up Chris Evans) is pitted against the Nazi menace, which here takes the villainous form of archenemy the Red Skull (Hugo Weaving at his scenery chewing best), who like his heroic counterpart receives his powers through a super soldier serum developed by a German scientist. The script by Narnia co-writers Christopher Marcus and Stephen McFeely is stuffed with plenty of fan-boy references, and they have a sure grasp of Cap’s historical context and mythology. Director Joe Johnston handles the first half the film, which deals with the transformation of nine stone weakling Steve Rogers into the shield-wielding wartime icon, with equal surety. Unfortunately, Johnston loses the plot a bit in the second half, when Cap goes up against the Red Skull in occupied Europe, by overdoing the action at the expense of coherence. Nevertheless, Captain America warrants a look, and it does set things up nicely for The Avengers, which, written and directed by Buffy creator Joss Whedon, ought to be something much more special. Out now on selected release.